When Learning at Work Week (LaWW) began on Monday 14th May, all eyes were on the mezzanine at Blackpool Victoria Hospital to see how union learning reps (ULRs) Bev Herring and Jane Eyre would be launching this year’s packed programme of events at ‘the Vic’. Expectations were high after dancing drag queens kicked off proceedings last year and a choreographed flashmob took over the mezzanine the year before. And when the clock struck twelve, an extravaganza of flamboyant feathers and high kicks from Viva Blackpool got things going in the grand fashion. But the fun was only just starting when the curtain-raiser ended, because Bev and Jane are firm believers in making all their learning enjoyable, accessible and inclusive. A quick glance at this year’s LaWW programme at the Blackpool Teaching Hospitals Trust confirms that, since alongside subjects like IT, foreign languages and English grammar there will be sessions on calligraphy, finger-knitting and flower arranging, among many other things. Bev and Jane know that their approach to learning at the hospital is just what the doctor ordered as far as their members and colleagues are concerned. “A lot of people I work with say, ‘It’s too late for me, you’ll never get me into learning’,” explains Bev, who joined the workforce 22 years ago as a catering assistant. Last year the duo attracted 130-plus participants at the 23 different workshops they organised for LaWW – and they are looking forward to an even bigger turnout for the 23 they have organised for this year. “It shows people that UNISON don’t just support you when you’re in trouble but we do educational and recreational courses as well,” Bev says. Mixing the educational with the recreational serves an important purpose for the staff and their employer, Bev points out. “It’s all about people’s well-being – and if you help somebody with their well-being, you cut down on sickness, people don’t need to take time off for stress, and this helps the individuals and the Trust,” Bev says. Bev originally decided to take on the ULR role after listening to an inspiring talk three years ago by a member of the regional UNISON learning team. “The whole time I’ve been working at the Vic, I’ve been a member of UNISON and I have always been involved in the branch – at one point I was the treasurer, I’ve always been the health and safety rep within my department and I’ve always attended branch meetings,” Bev recalls. 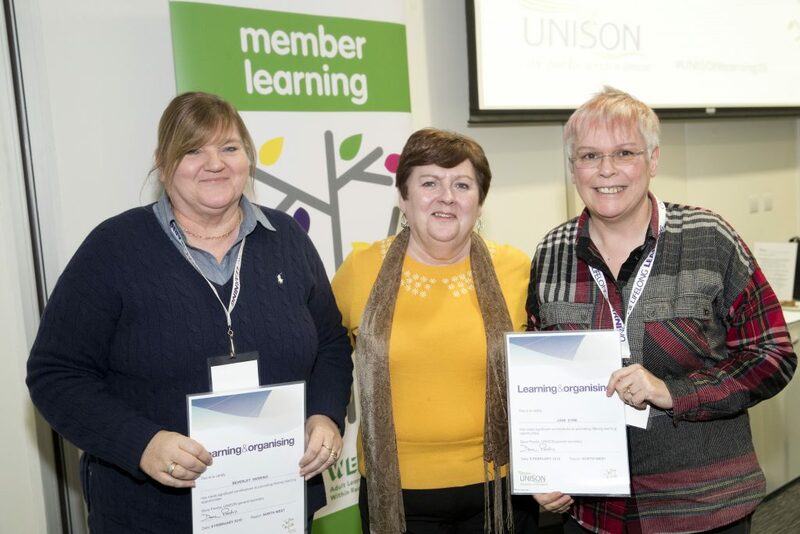 Bev and Jane signed up to train as ULRs on a course at UNISON centre taught by Member Learning Officer Davinder Sandhu and the then Learning and Workforce Development Officer Emma Lipscombe. Bev admits that she was feeling nervous at the beginning of the course. “This was the first learning I had done in a long, long time and I was a little daunted because a lot of the people in the room were a lot higher qualified than me: I’ll be honest – my initial reaction was, ‘I’m a bit intimidated’,” she recalls. In addition, Bev had not undertaken much learning since her unhappy experience of education at the local grammar school in the 1970s. The UNISON approach couldn’t have been more different, she says. “Davinder and Emma made everybody feel equal and I got through the course with support from Jane, who has been by my side through all the learning that I’ve done – she has been my mentor since we started,” Bev says. Since returning from their ULR training, Bev and Jane have not looked back on their quest to help encourage ever-increasing numbers of their colleagues to return to learning. Bev is now on a 12-month full-time secondment from the catering department, with one day a week paid by Blackpool Health Branch and the rest by UNISON’s Inclusive Learning project, as part of a programme to support workplace learning at branch level. Bev is especially proud of the their work promoting maths with the charity National Numeracy, which has led to the trust embedding the Numeracy Challenge in the training plans for first year nurses (preceptorships) and healthcare assistants (HCAs). The other breakthrough Bev is happy to have helped achieve is the provision of computers in the canteen so that ancillary staff who don’t use computers in their day-to-day work can access digital resources. “We have managed to get funding from UNISON’s Inclusive Learning project for a couple of computers and we have made a deal with one of our directors who is providing the desks that we’re putting them in the staff canteen for the ancillary workers: we’re going to run a six-week course to get them all on the computer,” Bev says. And Bev is also developing her own IT skills. “I have basic skills myself on the computer, which I am using to help the ancillary workers, but I am also now being tutored by Jane to develop my own skills on it – and that is something I never thought I would do,” Bev says.